Samsung Galaxy S7 edge comes in a cool black box, which holds a fast-charge-enabled AC adapter, a microUSB cable, the new Samsung headphones, and a microUSB-to-USB adapter. The small thingy came as a surprise to us, but we found it quite helpful - it enables USB OTG letting you connect peripherals and even charge other devices. The headphones are the same as the ones shipping with the Galaxy S6 edge. This season's S7 lineup looks pretty much like their predecessors but Samsung's decision to give the edge model more screen real estate makes sense. Users are given a choice between a 5.5" phablet with a dual-edge curved display and a standard 5.1" screen. The identical display size last year nearly defied the purpose of having a pair of flagships competing against each other. 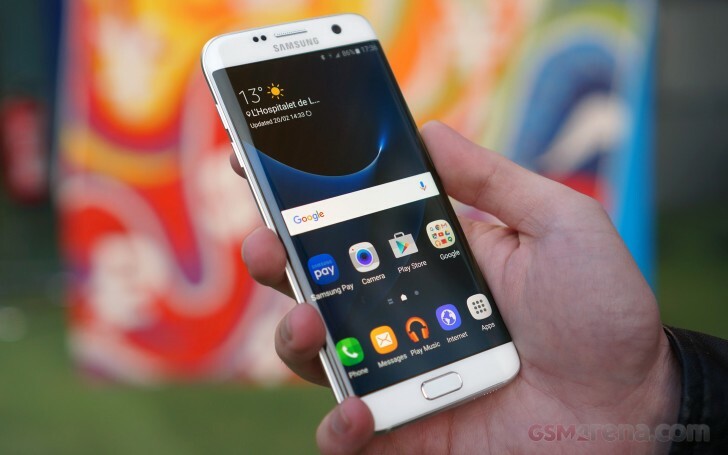 The new Galaxy S7 edge measures 150.9 x 72.6 x 7.7mm. That's 8mm taller and 2mm wider than the S6 edge, and 3mm shorter and narrower than the S6 edge+. These two are a good reference considering the S7 edge sits right between in terms of screen size. The S7 edge weighs 153 grams, which is reasonable for a device of its caliber, yet a good 25g heavier than its predecessor. So, Samsung is in a way giving the Galaxy S7 edge more responsibilities than to just be the cooler S7 sibling. The 5.5" phablet is giving the S7 series more depth (different user bases) and the regular Galaxy S7 will probably have more breathing space than the S6 last year. That said, Samsung will probably skip the edge+ this time around. 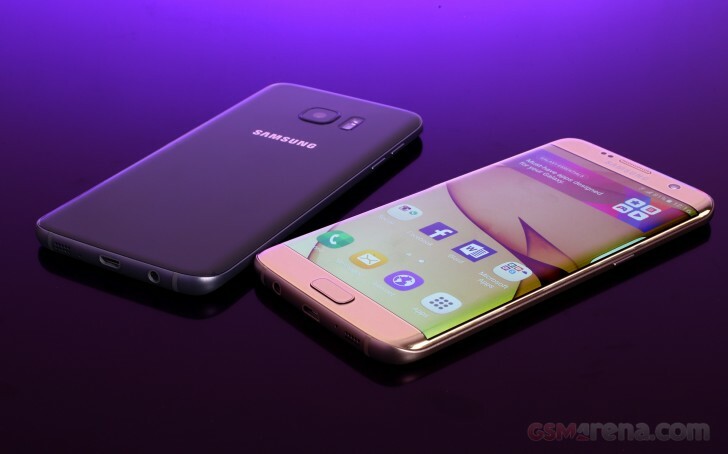 With a metal frame bordering the curved 5.5" Super AMOLED screen, and a sheet of curved Gorilla Glass 4 either side, the Galaxy S7 edge is, upon a casual glance, a scaled up S6 edge. But why change, when the Galaxy S6 edge is still one of the best looking devices in the market. The Galaxy S7 edge benefits from some minor touches, mostly in how the contour of the frame and the screen curves feel against your fingertips. So, yes, it's last year's design but still gorgeous - and this year's onyx black flavor certainly helps appreciate it even more. If you passed on the S6 on account of the missing water-proofing, the Galaxy S7 edge is IP68-certified, which means it can survive at 1.5m deep for up to 30 minutes. Even without extra flaps, both the audio jack and the microUSB port are waterproofed. The charging port has moisture detection however and won't let you charge the phone if the pins are wet. The Samsung Galaxy S7 edge is a stunner but this comes at a price. The dual glass design calls for handling with extra care and any sort of a protection case will inevitably cost some style points. It's the handling though that raises a little more concern, especially with the bigger screen - and therefore bigger overall footprint. The phone can be quite hard to pick up from a table because of its dual edge design - glass on the sides has hardly any grip. Worse yet, it seemed our unit needed, at the very least, some tweaking of the palm rejection algorithm. With a hand wrapped around the phone, the S7 edge occasionally detected the palm against the sides rather than taps on screen when trying to make a call, or hit links in the browser. This was particularly aggravating at the few occasions when we needed to pick up the phone and answer a call for example. This could've been only our unit but other than that, the feel of a curvy, smooth and cold Galaxy S7 edge is almost unrivaled. Now, that's something you'll lose if you opt for a bumper case, which however will surely pay off in the long run. We're sure the slightest damage inflicted on a beautiful device like the Samsung Galaxy S7 edge would be bitterly regretted. If you are familiar with the Galaxy S6 or S6 edge, there will be no secrets on the S7 edge for you, as all the controls are pretty much identical. Most of the front is occupied by the 5.5" display, which has even less bezel than the S6 edge's screen. Up above is the earpiece, with the familiar bunch of sensors, a status LED, and the 5MP selfie camera. Below the screen is the familiar button layout: the hardware Home Key/fingerprint reader combo, surrounded but the capacitive Back and Task Switcher keys. The metal Power/Lock set is on the right while the volume keys are on the left. The top has the second mic and the card slot. The latter accommodates both nano-SIM and microSD cards and is secured with rubber gasket. There is no IR blaster this time around, so no remote control duties on the S7 edge. The audio jack, microUSB port, the primary mic, and the loudspeaker are all at the bottom. Finally, the new 12MP camera is on the back, still accounting for a small hump, but a lot less conspicuous than on the previous generation. Its companions are, as usual, a single LED flash and a heart-rate sensor.